Review affordable home warranty plans online and apply for coverage, all without an agent. click here to GET your instant Home Warranty Quote & get covered today! by putting in only needed information. Get instant quotes on home warranties online and instant coverage online. Only basic information is needed to get appliance insurance quotes online. No need to deal with an agent to compare home warranty plans. home appliances due to wear and tear. Each policy will be different depending on the types of product that you choose, so always read the policy specifics. When it comes to a home warranty and home insurance there is a ton of confusion; however, the truth is that these products serve a completely different purpose and usually work together to give you total protection of your home. When something stops working in your house or breaks due to wear and tear, or is simply malfunctioning, a home warranty plan is what you will need. These plans will cover a variety of things like like what we showed above. 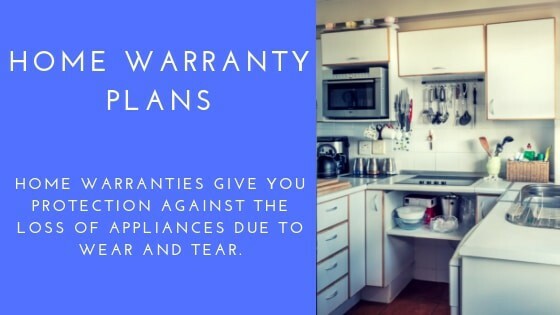 If your appliance stops working, you simply reach out to your home warranty company and they will send a specialist to assist with your item. A home warranty will not protect your appliances from external damage inflected on it on purpose or accidentally. That is usually when your homeowners insurance kicks in. If your dishwasher stops working or malfunctioning, you would want to call your home warranty company. If your dishwasher is stolen during a robbery, or destroyed due to a house fire, call your homeowners insurance company. With newer types of home insurance you can easily purchase your coverage using an online quote tool, within a few minutes; and home insurance companies are more equipped to handle catastrophe claims. If your car is damaged by a covered loss, then homeowners will kick in, however, in general, you should look to your auto insurance policy to help with almost any auto claim. It is easy to think that one size fits all when it comes to insurance but that just isn't the case. Keep in mind that each policy works different, and affects a different part of your home. Getting a home warranty quote is the first step to making sure your household items are protected. You can even customize your policy based on your specific situation like getting coverage for more than one refrigerator. How Much Home Warranty Cover Do I Need? A home warranty has many different plans and pricing. So, like you should do when purchasing renters or homeowners insurance, take an inventory of all the appliances you have in your home. Once you have a list together you need to make sure that whatever appliance insurance you decide to purchase will cover everything. Keep in mind that each home warranty will work differently. Each company will have different plans and different options, so I always recommend purchasing the best plan that will be available to you. You can then add additional options that you may need to the policy for an additional cost. If you don't know how to fix the things around your home and you don't have the funds to purchase new appliances at random. Then you need to purchase a home warranty plan fast, there is no reason to put yourself through the headache of it all. Homes on the market with a home warranty included sell on average 50 percent faster than homes without. Houses with home warranties return a sales price that averages 3 percent higher. As with most things, the days of sitting down at a coffee table to go over your purchasing options is a thing of the past. You can even buy a house or sell a house online now. a much better deal on your home warranty cost. Our companies can get you super fast home warranty plans within sixty seconds online and get you covered within a few minutes.